Vera Sonja Maass, PhD, is a licensed clinical psychologist, marriage and family therapist, and mental health counselor in private practice. Her teaching experience includes terms at the University of Indianapolis and Ivy Tech Community College. Maass, Vera. 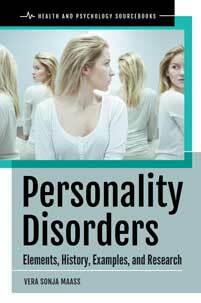 Personality Disorders: Elements, History, Examples, and Research. Praeger, 2019. ABC-CLIO, publisher.abc-clio.com/9781440860461. Details each of the 10 personality disorders, in a format that makes locating information easy.